Looking at NC Pryors I hope to find answers for us questioning our Tennessee Pryor families. Luke Pryor is one of the folks in Williamson County, TN I looked at through probate records a while ago (see post). His wife was Nelly/Eleanor. I looked recently at the will of William Rogers, her father. It adds another piece of documentation to support she was a Rogers. 31st August 1819, Estate divided among heirs by commissioners in Orange Co., NC. 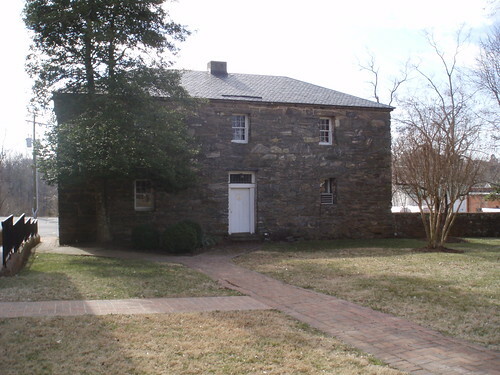 William and John Rogers signed the estate sale as administrators. Luke Pryor was named on 1805 and 1810 Tax lists in Williamson County, TN. It looks like he may have been living outside of NC at the time of the settlement of his father-in-law’s estate. My last post may be of significance for anyone searching this line. The Pryors in Guilford County, NC were connected to the Waggamon/Waggoner family. When Luke Pryor married Nelly Rogers in Orange County, Peter Waggoner was bondsman (see post). How Did Col. Samuel Pryor’s Genealogy Get So Messed Up? What this tells me is that the author had some data but it was beyond him to connect up the Pryor family. This doesn’t sound too reliable to me! Alas, it sounds also sounds too familiar! The Virginia Magazine article speaks of early land grants to Robert Pryor on Craney Creek in Gloucester County in the late l680’s and early 1690’s. The article quotes a Mitchell family Bible that is inscribed with the story from the 1780’s that Samuel Pryor married Prudence Thornton and had 10 children- William, John, Thornton, Robert, Luke, Frank (Francis? ), Joseph, Nancy, Molly, and Samuel. Because Molly Pryor was the direct ancestor of the Bible owner her year of birth was recorded as 1730. The writer then deduced from her year of birth that Robert on Craney Creek was old enough to be her grandfather and therefore the patriarch of this Pryor line. The author corresponded with Judge R. A. Pryor in New York. This judge is Roger Atkinson Pryor, the Confederate General who went to New York City after the Civil War. Judge Pryor used his father’s notes to fill in the pieces of Samuel and Prudence line carried on by their son John Pryor. The Judge didn’t state who John married but we now know from the Chancery Court Records that his wife was Mary Dennis. William Pryor, of Goochland, from comparison of all data, must have been the son of Colonel Samuel Pryor, with whom the account of the family given in the last number begins. Samuel Pryor, of Amelia and Goochland, must also have been another son. Francis Pryor, of Orange, named in the Louisa deed, another son. John Pryor of King and Queen, named in the Hanover deed, was probably a brother of Colonel Samuel Pryor. I encourage family researchers to slow down and ask questions. Questions like, What’s the evidence that Francis Pryor of Orange County who deeded land in Louisa County is related to William and his father Samuel? And, where did the author find documentation of a relationship between John Pryor in King and Queen and Col. Samuel and his son William? The 1768 deed in Louisa County that names Francis Pryor and his wife Frances doesn’t name any other Pryors, nor did the author provide the names of other parties to the deed. I’ve done some online searches and can’t find the deed quoted in full, nor am I able to find any information on this Francis Pryor. There’s certainly not enough information to conclude he’s related to either Col. Samuel or his son William Pryor. A John Pryor from King and Queen County may be pure speculation and a very poor conclusion. There’s a record of a “Major” Pryor in King and Queen County dated 1747 that mentions land in Brunswick County. The John Pryor in King and Queen records shows up in 1780 and that is Major John Pryor born 1750. He wasn’t even born in 1747 so he can’t be the Major Pryor who showed up on the 1747 record. I looked in Brunswick County and found the older Major Pryor there– named with his wife “Anne” on an 1749 indenture. It’s not the John Pryor, son of son of Col. Samuel Pryor because that John Pryor was married to Mary Dennis, not an Anne. There’s a 1742 indenture filed in Amelia County for Philip Pryor and wife Ann of Hanover County, VA. The indenture deeded land to William Berry, possibly the same William Berry who married Molly Pryor (a daughter of Col. Samuel Pryor). Was Philip Pryor the same man as Major Pryor? I think these were two different people because there’s an indenture for Philip Pryor that was witnessed by Major Pryor. Possession obtained by William Berry in presence of Major Pryor & Timothy Murrell on Mar. 18, 1742. Deed ackn. By Philip Pryor & ordered rec. at Court held Mar. 18, 1742, after Ann, his wife, relinquished her Right of Dower. While these old genealogy articles may contain histories and records that are no longer available, they need to be used with a spoonful of skepticism. Ask questions and lets get our hands on the old documents!